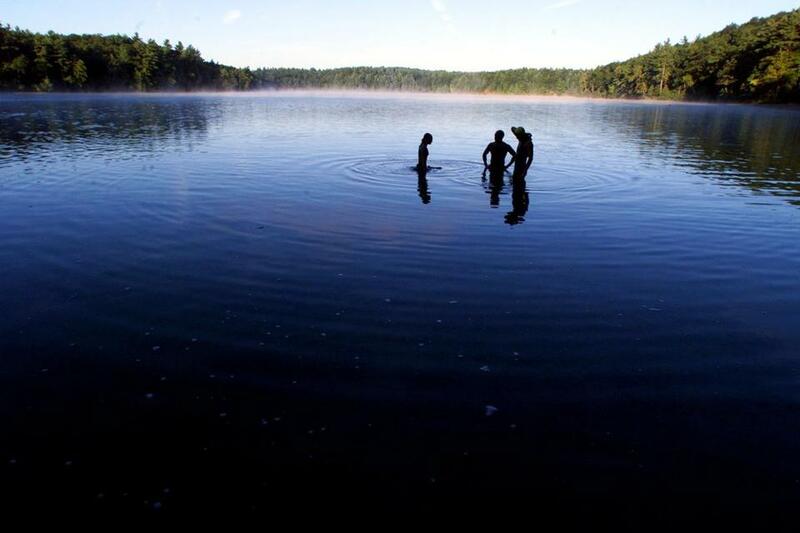 Where does Walden Pond get its water? Since Henry David Thoreau’s time, visitors have been curious about the large body of water in Concord because it has no visible inlet or outlet. How could the pond undergo such varied year-to-year changes in water level without being connected to a river or stream? Was it replenished by an underground spring? Some folks even wondered if it could be a bottomless pit. Most questions have been answered since Thoreau published “Walden” in 1854 detailing his experiences and observations during the two years he lived in a cabin near the pond. Walden Pond is indeed very deep — 102 feet. It is a kettlepond, forming 15,000 years ago when a chunk of glacier sat in a large hole in the ground and then, very slowly, melted. John Nevison, a local author and management consultant, will soon publish a paper in which he created a model detailing the seasonal fluctuation of Walden Pond’s water level. In 2001, the US Geological Survey published a scientific report, “Geohydrology and Limnology of Walden Pond, Concord, Massachusetts” containing the raw data that Nevison would go on to use in his paper. Though the pond has evolved over thousands of years, some are concerned about its health. Over the last 150 years, there’s been an increase in the number of swimmers who visit the pond every summer. Swimmers tend to urinate in the pond, which results in the pond’s phosphorous level tripling during the summer months. There is a worry among scientists that too much phosphorous could result in the growth of algae blooms that can introduce toxic compounds to the water, eventually making it dangerous for swimmers. “If you really get lots of extra phosphorous in the pond, you can get algae blooms that introduce toxic cyanide-like compounds,” said Nevison, whose paper about Walden Pond’s phosphorous levels was published in 2016. Nevison will host two talks about his research next month at Thoreau Farm, 341 Virginia Rd., Concord. The first, “How Walden Works: The Quiet Pattern of the Pond,” will take place Sept. 10 from 3 to 4:30 p.m. The second, “Is Walden Okay? : Patterns of Phosphorous and Oxygen in the Pond,” will be on Sept. 17 from 3 to 4:30 p.m. The events are free and open to the public. Email margaretcb@thoreaufarm.org to make a reservation. Sophia Eppolito can be reached at sophia.eppolito@globe.com.